The first time I made these I couldn’t get over how simple they were to make! Each time I make them now I alter the chocolate coating slightly. For example I used a dark chocolate with an orange crunch in it, which worked surprisingly well with the baileys flavoured filling. I havn’t made any filling variations yet but I believe that tia maria would be damn tasty in them as would creme de menthe for a minty alternative. 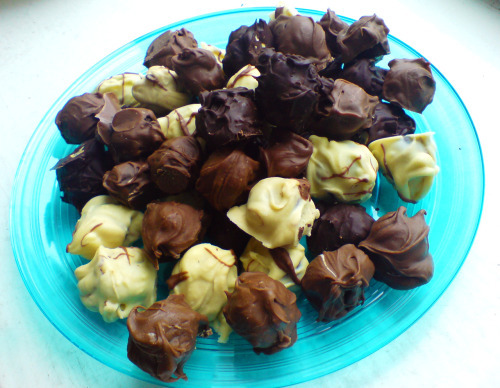 The only mildy difficult part is coating the truffles in the melted chocolate, the task can prove slighly messy but enjoyable none the less! The recpie I use is from a wonderful book called Coffee by Banks, McFadden and Atkinson; I have just tried to locate it on amazon and the exact one I own is not there though there are variations of it available. 1. Melt 225g of the plain chocolate in a bowel over a pan of simmering water.Stir in the cream and the liqueur, then chill the mixture in the fridge for 4 hours, until firm. 2. Divide the mixture and roll into a little balls. Place in the fridge again and chill until firm again. 3. Melt the remaining plain, white and milk chocolate in separate bowls. 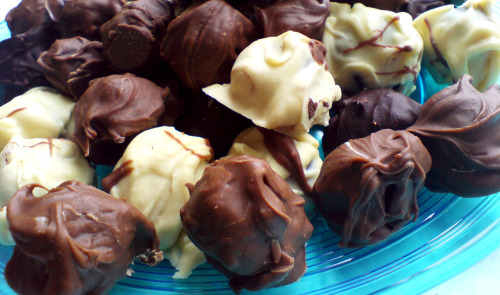 Using two forks, carefully dip the truffles into the melted chocolate. Repeat with each flavour. Place on greaseproof paper. Leave to set. Whoah, my tiny kitchen did not thank me for this challenge!! Mess would be quite the understatement!! This month was quite challenging for I had never made any type of layered cake before. 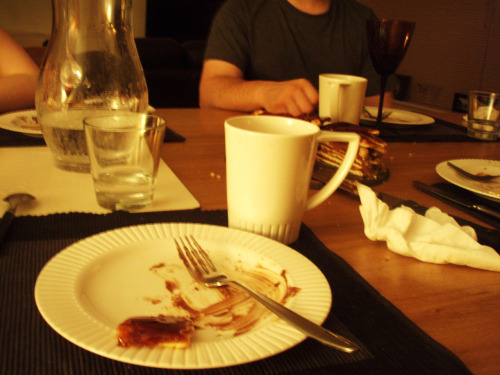 Admittedly I was a little daunted but once I got, well, stuck in, I began to enjoy myself. 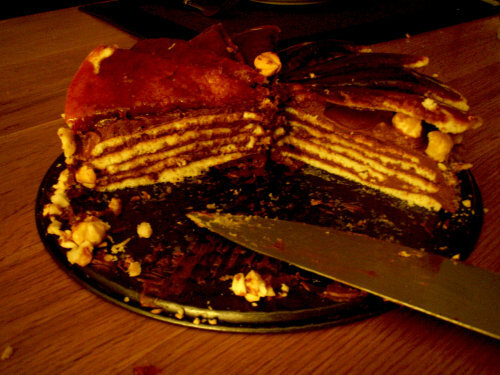 The only real problem I encountered was knowing how much batter to use for each layer. That was a bit of a guessing game and only one layer fell victim to being too thin and so was a bit reluctant to release itself from its baking sheet. The chocolate butter cream, on its own, was slightly too sweet for me but added to the cake it worked well. 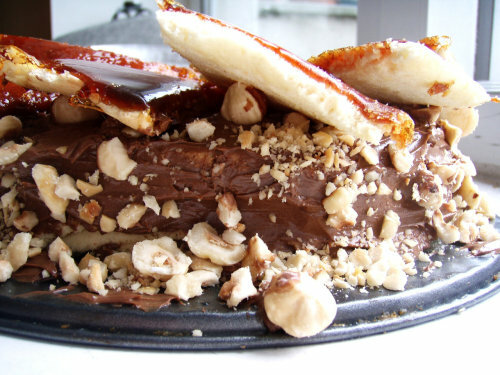 The hazelnuts also added immensely to the overall taste. I spent a Saturday afternoon baking the cake and as my brother and my soon to be sister-in-law were having us over for dinner that night, the cake came along too. I was so intrigued as to how it would taste, we all were! Everybody enjoyed it but I’m still undecided as to whether I liked it or not, I didn’t not like it, but I wasn’t blown away by flavour, and for that reason I’m not sure I would make this again. My mother raved about it though, no better seal of approval! 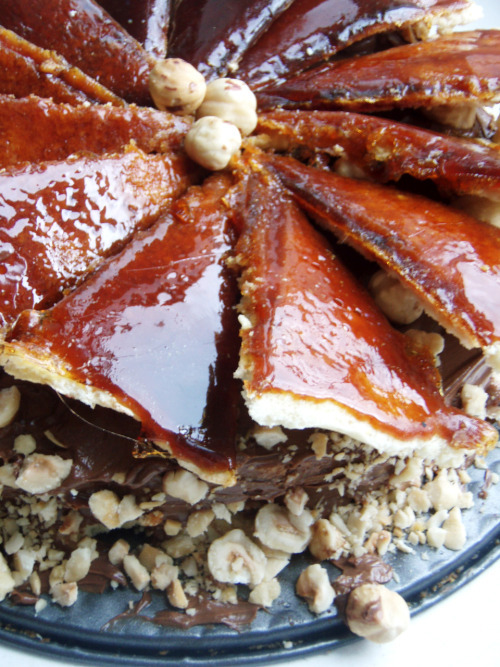 4.Propping a hazelnut under each wedge so that it sits at an angle, arrange the wedges on top of the cake in a spoke pattern. If you have any leftover buttercream, you can pipe rosettes under each hazelnut or a large rosette in the centre of the cake. Refrigerate the cake under a cake dome until the icing is set, about 2 hours. Let slices come to room temperature for the best possible flavor. 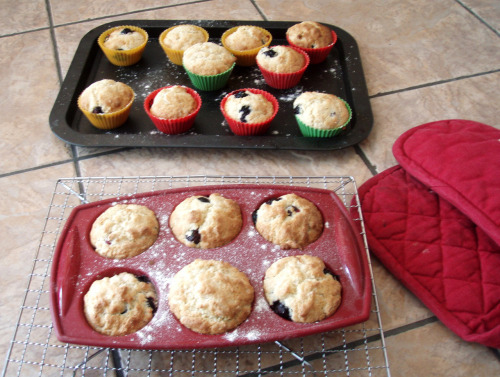 Blueberry mini muffins, to be exact. 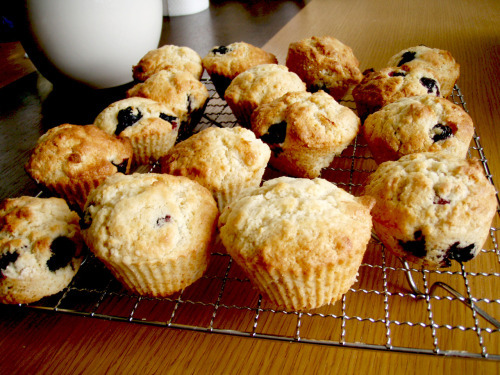 They are my favourite flavour of muffin and when given the choice of chocolate or blueberry, this juicy little berry will win me over every time! Aswell as being exceedingly tasty and lushous, research has shown that the blueberry is very rich in anti oxidants and so is great for you immune system. See here for the other great benfits. 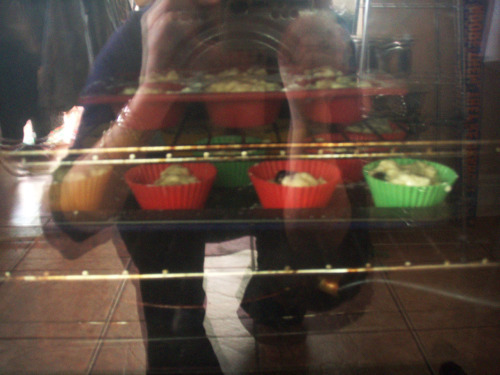 The muffins themselves turned out well but were not as moist as I had hoped. It’s so easy to over mix the batter and leaving yourself with dry buns rather than succulent muffins.